Making the move to a smart home set up just got a little more tempting. Until January 8 you can get your hands on a Google Home smart speaker and the Philips Hue starter kit for just £169.99. Smart lighting and smart speakers are two of the items that have the most obvious mainstream draw at the moment, but making the shift to a smart lighting setup can be a prohibitively expensive proposition, especially when compared to conventional light bulbs. That’s why this is such a great deal. 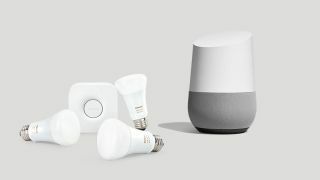 You’ll be getting your hands on a set of three industry leading smart bulbs, the hub to control them, a smart switch, and the top-of-the-range Google Home smart speaker - all for £129 less than you'd usually pay. The deal is available from Currys, Argos, and John Lewis. As the starter kit is usually £169 on its own, you’re basically getting one of the best smart speakers on the market for free. At least, that’s how we’re thinking about it. Just make sure you get the right fitting for your bulbs, there are different versions of the deal for bayonet, screw cap and GU10 (the fitting usually used in small halogen bulbs).